Boeing celebrated completing its 10,000th 737 single-aisle jet, which brought air travel within reach of ordinary Americans. And 50 years after it entered service, its importance to Boeing’s bottom line has never been greater. 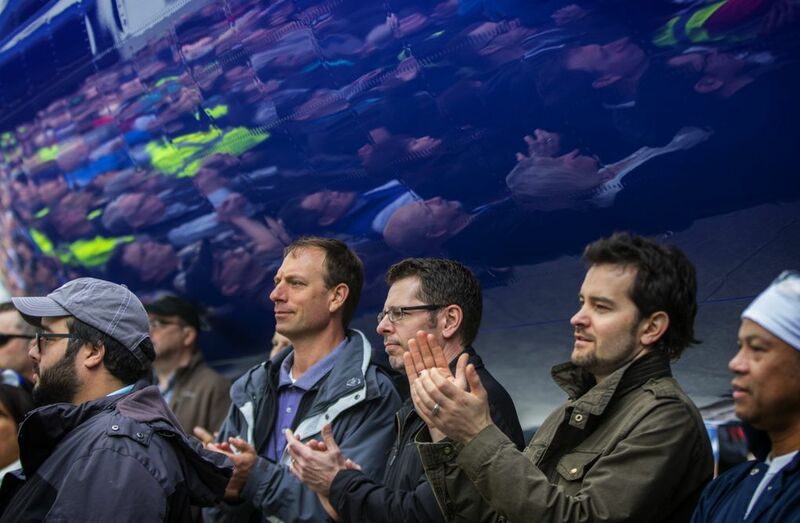 Boeing celebrated Tuesday production of its 10,000th single-aisle 737, putting what is already the best-selling jet of all time on track to become the best-selling large transport airplane in history. Yet when the plane first flew more than 50 years ago, no one could have guessed its destiny. The pilot in command on that first flight, now 93, recalled hopping around the globe in 737s in the years after the plane’s 1967 debut to goose flagging sales. Bob Bogash, 73, who as an engineer helped build the first airplane, flew in a later globe-spanning sales flight aboard the 1,000th 737. He recalled a grueling journey in 1984 from Seattle across North America, then over the North Atlantic via Iceland to various European capitals, crossing the Sahara to visit nine countries in Africa as far south as Zimbabwe, then flying over the South Atlantic to French Guiana and Venezuela, before returning home to Seattle via Puerto Rico and Memphis — 19 countries in 27 days, routinely waking at 5 a.m. and getting to bed around midnight. Especially productive were the Stockholm and Amsterdam stops, where the Boeing team persuaded SAS and KLM, two airlines that flew Douglas Aircraft DC-9s, to flip to the 737. The 737’s evolution over five decades shows a progression from a short, stubby puddle-jumper to a much-larger plane carrying twice as many passengers more than twice the distance. 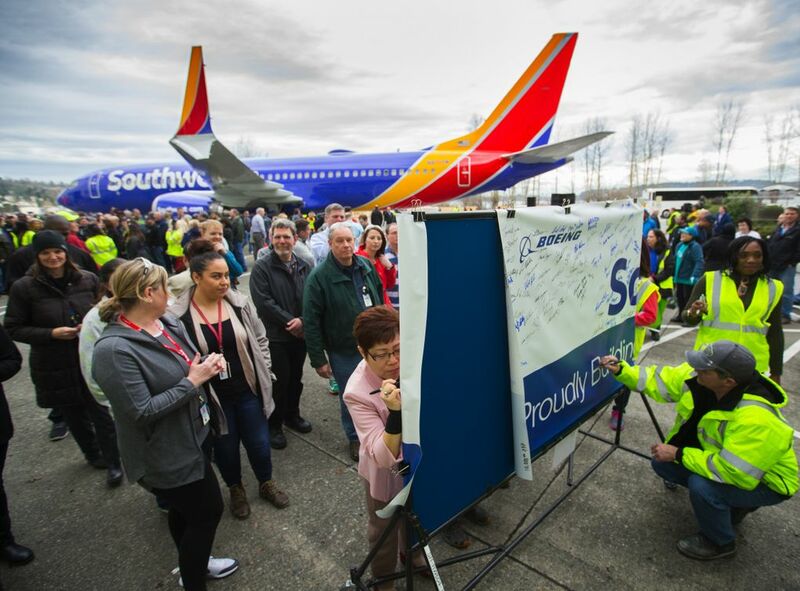 The airplane celebrated Tuesday was the latest 737 MAX 8. 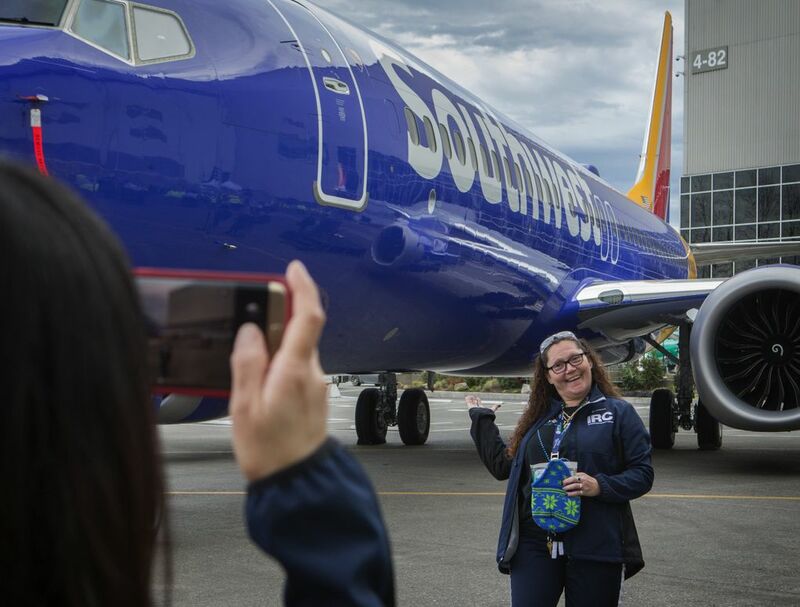 To mark the occasion, top 737 customer Southwest Airlines donated to the Boeing employee community fund a check for $10,000 earmarked for disaster relief. 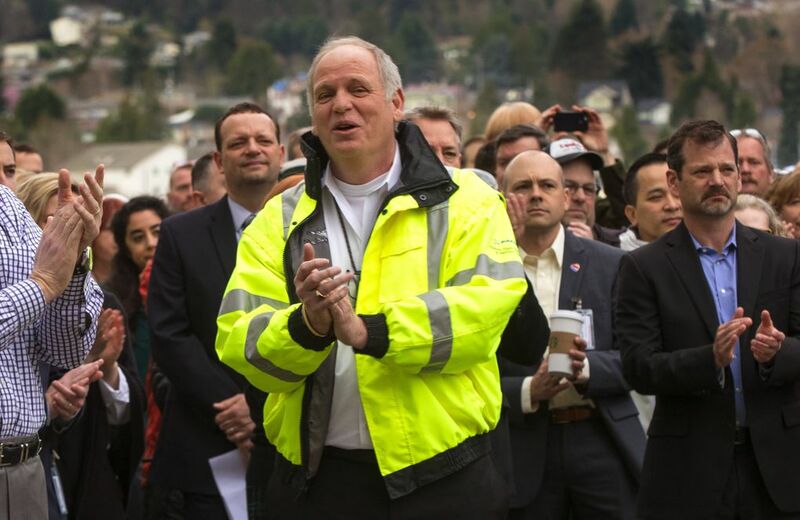 Among several hundred employees present was David Knowlen, 74, who started at the company 52 years ago and was present at the 1967 rollout of the first 737 at Boeing Field. Today, he’s on a special projects team that aims to preserve Boeing’s legacy in aviation history by working with museums and other institutions. Knowlen recalled that at the rollout, a row of flight attendants from airlines that had ordered the new jet christened it by smashing a Champagne bottle over the wing. More than 50 years later, he said, the biggest change is in how the plane is built. His job back then was to check the alignment of parts going on the airplane. Today, the assembly process is increasingly automated and the production rate has correspondingly accelerated. Boeing delivered the first 5,000 airplanes between 1967 and 2006. The second 5,000 have been delivered in just the last dozen years. 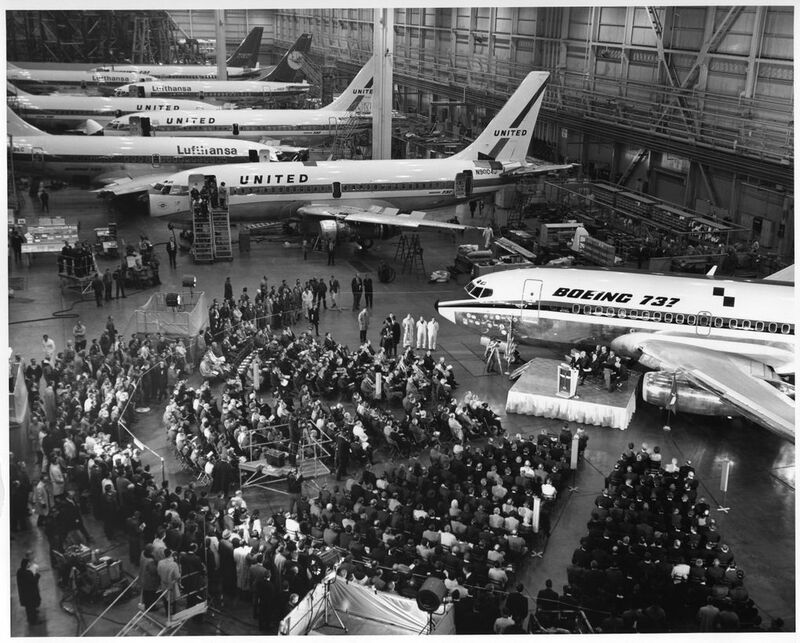 When that first 737 rolled out at Boeing Field, Renton was still building 707s and 727s, the Everett plant was still under construction for the new 747 jumbo jet, and much of the world’s attention was focused on Boeing’s Developmental Center in Seattle where the Supersonic Transport (SST) was being developed. The SST was canceled. The 707 and 727 are long gone. And the 747 may not survive long beyond 2020. But over the next eight to 10 years, Boeing will still be building the 737, which over five decades has gone through four major iterations to arrive at its latest incarnation, the new 737 MAX. The original plane, the 737-100, was short and stubby, designed to be a “puddle-jumper,” flying short-haul routes such as Seattle to Spokane. But its performance was disappointing, said first-flight pilot Wygle. Drag was higher than expected, resulting in less range, higher fuel burn and steeper operating costs. “There was a lot to do to the airplane before we got it right where we wanted it,” said Wygle. Boeing tweaked the aerodynamics in steps and then in 1981 introduced a significant update with the 737-300, -400 and -500 variants — referred to now as the “Classic” 737 models — featuring new, highly efficient CFM engines and improved avionics. “That made the big difference,” said Wygle. The next 737 refresh, in 1993, was almost a new airplane. Shocked by United Airlines’ purchase of the rival Airbus A320 in 1992, the following year Boeing launched the so-called 737 Next Generation — the 737-600, -700, -800 and -900 models — with a new wing and ever-more-efficient CFM engines. This was a hugely successful variant, with about 6,600 delivered to date. Southwest made it the go-to airplane for the new “low-cost carrier” airlines that wanted an efficient, reliable flying machine with fast turnaround times. Today, Southwest is the jet’s leading customer, with an all-737 fleet of more than 700 airplanes and more than 400 others on order. The proliferation of low-cost flights pioneered by Southwest on the 737 has made flying mundane, if often stressful. But it has also brought a huge expansion of air travel as middle-class people all over the globe embrace flying. Today, Boeing estimates that more than three million passengers fly on 737s around the world every day. Southwest’s vice president of maintenance operations, Landon Nitschke, said Tuesday that his airline alone carried 542,000 passengers on one particularly busy day. Boeing Commercial Airplanes chief executive Kevin McAllister noted that since the jet first entered revenue service, 737s have carried about 23 billion passengers in total. “When you can carry three times the world’s population in an airplane like this, that’s something to wake up for every day,” he told the assembled employees. Parked behind McAllister as he spoke was the jet that is surely the final 737 iteration — the 737 MAX. The launch of this model was again provoked by Airbus, when the European jet maker sold its A320neo — the A320 with a new engine — to American Airlines in 2011. Boeing immediately dropped plans for an all-new 737 replacement that would have taken years to develop, in favor of re-engining the 737 to create the MAX 7, 8, 9 and 10 models. On Friday, Boeing expects to have the first flight of the smallest MAX model, the MAX 7. The original 737-100, less than 91 feet long with a wingspan of 93 feet, had a range of about 1,770 miles and in two classes seated fewer than 100 passengers. The 737 MAX 8, almost 130 feet long with a wingspan of nearly 118 feet, has a range of more than 4,000 miles and seats nearly 180 passengers. The added range capability is now opening up a new era of low-cost carrier international flights, with operators such as Norwegian flying nonstop across the Atlantic. With more than 4,600 unfilled orders still to be delivered, within three years the 737 should surpass the propeller-driven Douglas Aircraft DC-3 in total numbers produced. Just over 600 of those were built for civilian use, and then 10,000 more were produced during World War II as C-47 military transports. Including Japanese and Russian licensed models, more than 16,000 DC-3 variants were built worldwide. Before the MAX ends its run, the 737 could surpass even that target. 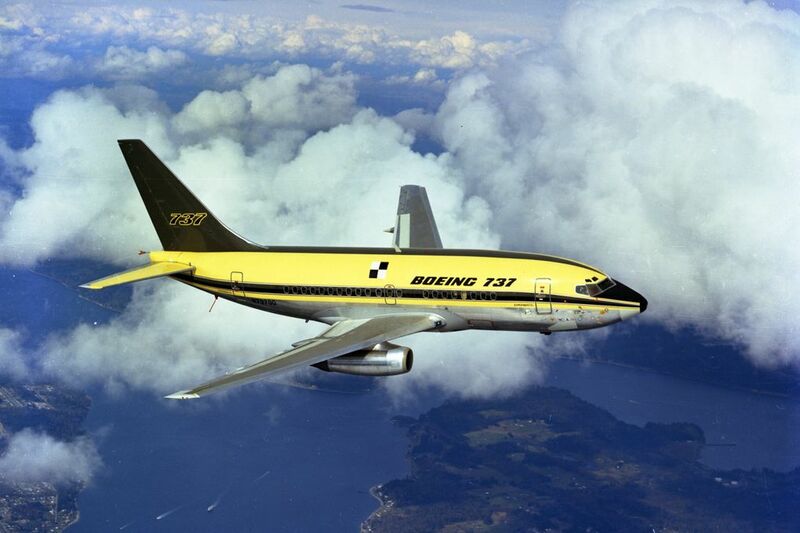 The first 737 was built in Plant 2 at Boeing Field, before a production line was set up at the nearby Thompson site. 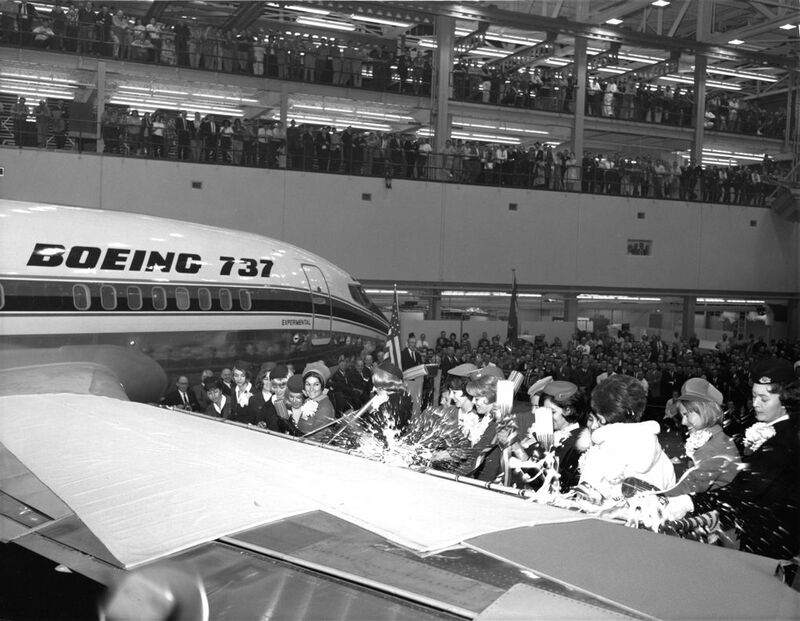 Altogether, 271 of the planes were built at Boeing Field. 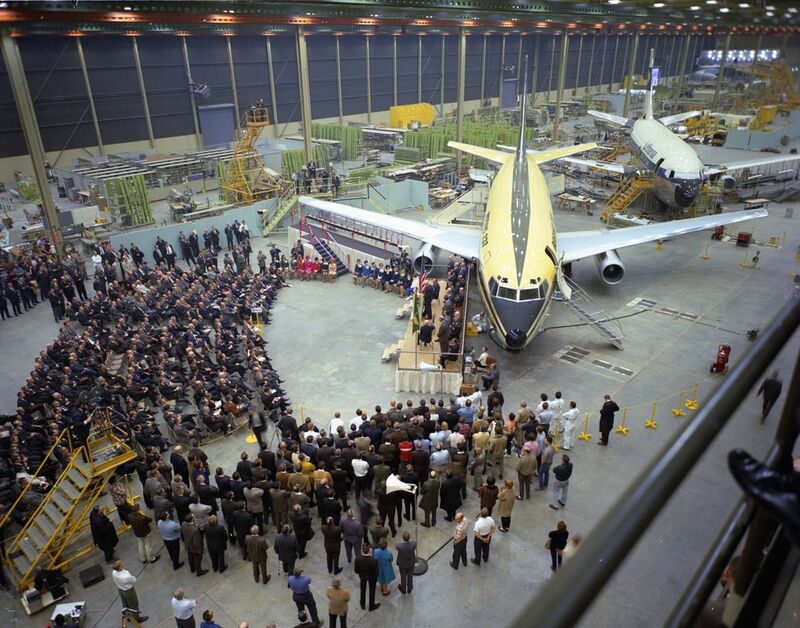 Production moved to Boeing’s Renton factory in 1970, and the rest of the 10,000 rolled out there. In a testament to just how fierce is the 737’s competition from the Airbus A320 jet family, it’s noteworthy that although the A320 entered service two decades later than the 737, Airbus has already delivered more than 8,000 of those models and has another 6,000-plus on firm order. That means the Airbus jet, a relative stripling, is running neck and neck with the 737 for the largest final order count. As the two rivals battle for sales in the booming single-aisle market, each is using new automated manufacturing equipment to accelerate production to unheard-of levels. The Renton 737 plant will ratchet up production from 47 jets per month to 52 per month around midyear, before an announced rate hike to 57 per month in 2019. And speculation is rife that Boeing will go higher still, to 63 planes per month and perhaps higher. Last year, about 42 percent of Boeing’s commercial airplane sales revenue came from the 737. As production spikes in the next few years, that proportion will grow. The aging baby of Boeing’s jet lineup will provide the largest slice of the cash flow needed to fund its future new airplanes. At Tuesday’s ceremony, two longtime 737 workers — Darry Woodson, a Machinist union shop steward who helps build the wings; and Skip Frett, another machinist who installs interiors — talked about the pride they feel in their work and how it’s allowed both to raise their children, buy homes and build strong middle-class lives. “I’ve raised four beautiful daughters thanks to the Boeing Company,” said Woodson. Observing the employees crowding happily around the airplane, 737 veteran Knowlen remarked on the passing of time and what’s not changed at Boeing since the rollout in 1967. Information in this article has been corrected to clarify that the event celebrated the production, not the delivery, of the 10,000th 737. Boeing will formally deliver the plane to Southwest in the coming weeks.